But worshippers refused to back down. One resident said they would not “let the government touch the mosque”. For centuries Hui Muslim mosques were built in a more Chinese style, and it appears that the new structure is viewed by the local government as an example of a growing Arabisation of Chinese Islam, the BBC’s China correspondent, Stephen McDonell, reports. Many questioned why the authorities had not stopped construction of the mosque, which took two years to complete, if it had not been granted relevant permits, according to the Hong Kong-based South China Morning Post newspaper. However, an official from the local Islamic Association said that the mosque would not be demolished entirely. He told Reuters news agency the government only wanted the structure “renovated to reduce its scale”. Later reports suggested that the authorities had agreed to remove eight domes. But one of the protesters was quoted by the Associated Press news agency as saying that this proposal was unacceptable to the Muslim community. 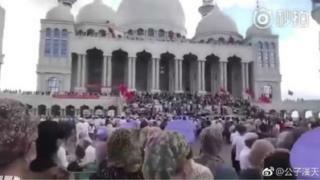 The protester added that the mosque had been conducting prayers attended by thousands of people and had been built with donations from congregants. There has been no comment so far in Chinese state media. In theory, China’s constitution guarantees religious freedom but in practice religious activities remain tightly controlled by the government. Christian churches, for example, have in the past been forced to remove crosses from their roofs, after the government said the symbol broke planning rules. In recent years, the atheistic Chinese Communist Party has become particularly wary of foreign religious influences and authorities have embarked on a campaign to “sinicise religion” – ie make it more Chinese. 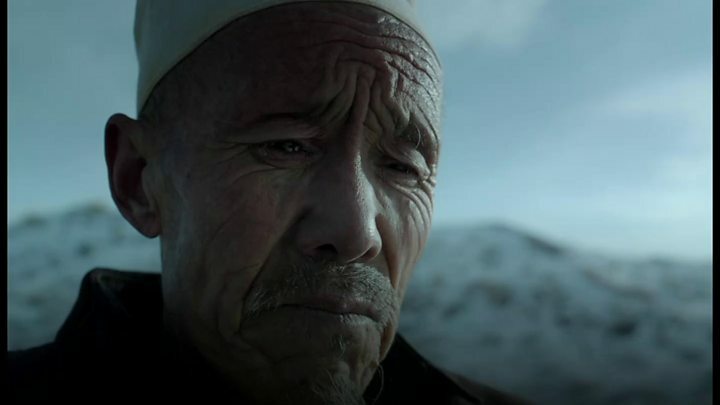 Rights groups say citizens in Xinjiang are subject to increasingly intrusive methods of government surveillance and control, with many punished for “extremist” behaviour like wearing veils in public places, or refusing to watch public TV programmes. But the current move to demolish the Ningxia mosque is an indication that the government is now looking to extend control over other Muslim ethnic minorities, says rights group Amnesty International.